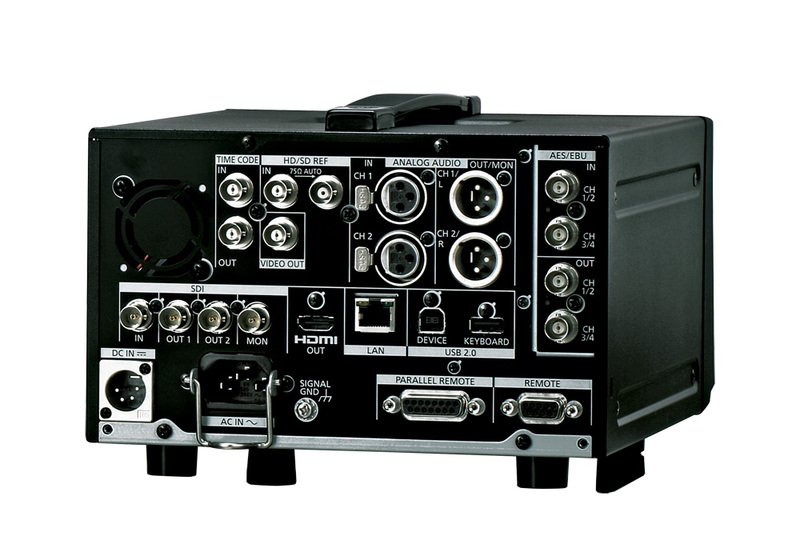 AVC-ULTRA codec field recorder/player including AVC-LongG50/25/12*1/6*1. Host of input/output interface connections both AV and IT. Mains and 4 pin XLR 12V DC powered. Compact and light weight for easy handling. 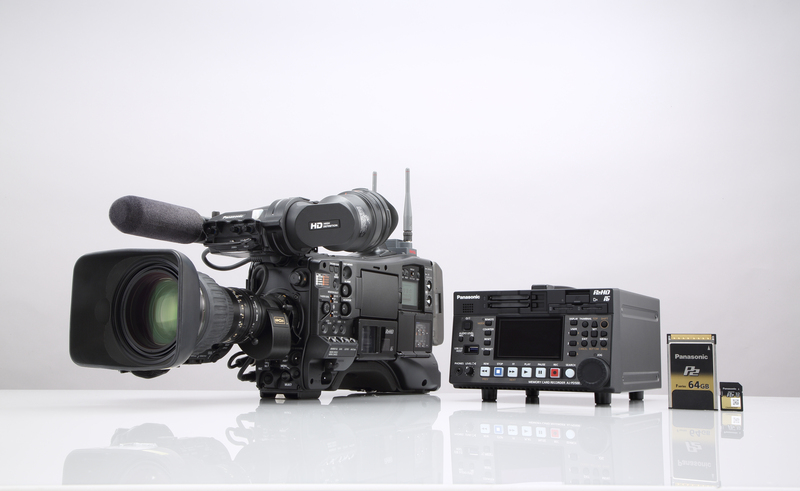 Introducing the AJ-PD500, the first P2 HD recorder with native AVC-ULTRA recording and built-in microP2 card slots. 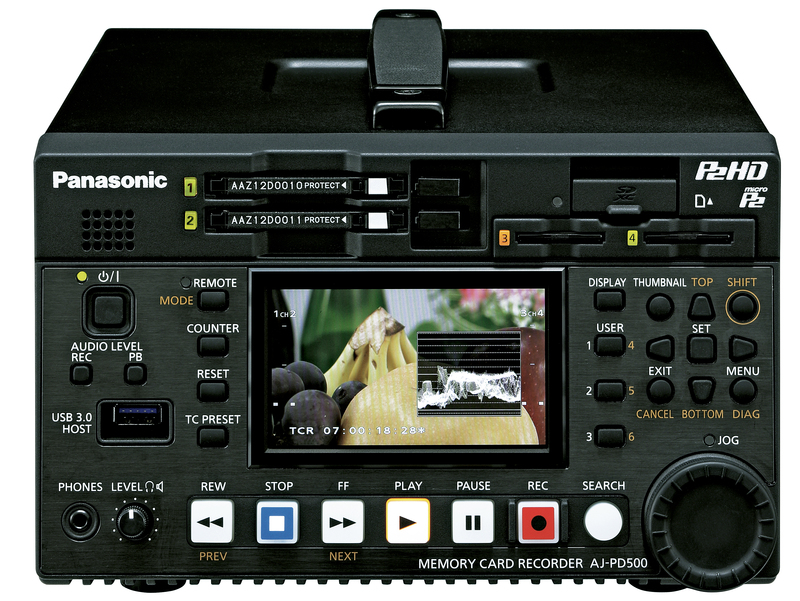 Its range of format choices (including AVC-LongG as standard, AVC-ULTRA Class200 and AVCHD playback as options*1) and array of professional input/outputs make the AJ-PD500 ideal for use in reality television, long-form documentaries, live events, satellite facilities, news trucks, and as a redundant playback/record device in news facilities. The AJ-PD500’s other powerful features include an intuitive, multi-control jog dial; native 24p recording, a super-fast USB 3.0 interface; and 24-bit four-channel digital audio, two-channel analogue audio. 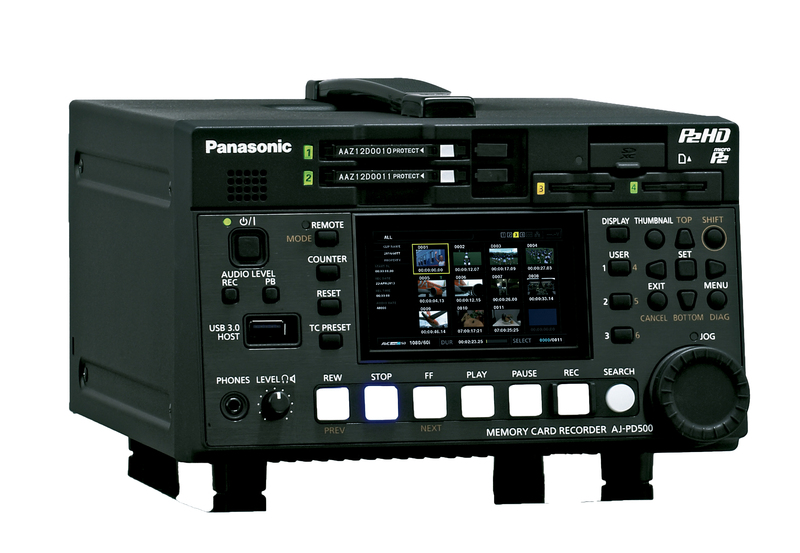 Panasonic’s AVC-ULTRA offers master-quality and/or low-bit-rate 10-bit, 4:2:2 recording in Full HD to meet a variety of user needs from mastering to transmission. AVC-LongG, designed for applications where file size is critical, offers 10-bit, 4:2:2 sampled recording in a much smaller file size, saving storage cost and transfer times over MPEG-2 while maintaining equal or better video quality. 1080p recording at 50 frames per second is added to existing AVC-Intra compression modes, and also affords 24-bit, 16-channel audio. For ultra high-end mastering and mezzanine workflows, the Class200 option will produce visually lossless compression, ideal for migrating current HD tape masters to a file-based format without degradation, and with a far smaller file size than many platform-specific mezzanine formats. The AJ-PD500 has two built-in slots for Panasonic’s new microP2 cards, which have an SD card form factor. 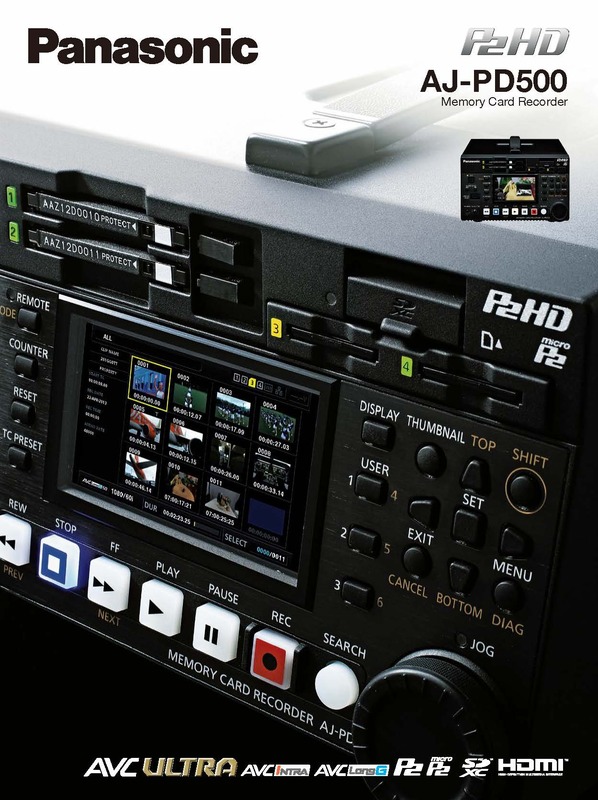 The PD500 also has two standard P2 card slots*2, as well as a SD card slot for proxy/metadata and AVCHD Playback*1 (option). 12V battery-operated, the AJ-PD500’s rugged, half-rack design holds up to the demands of field production, yet at under 4kg its compact (half rack mount) and light for easy transport. 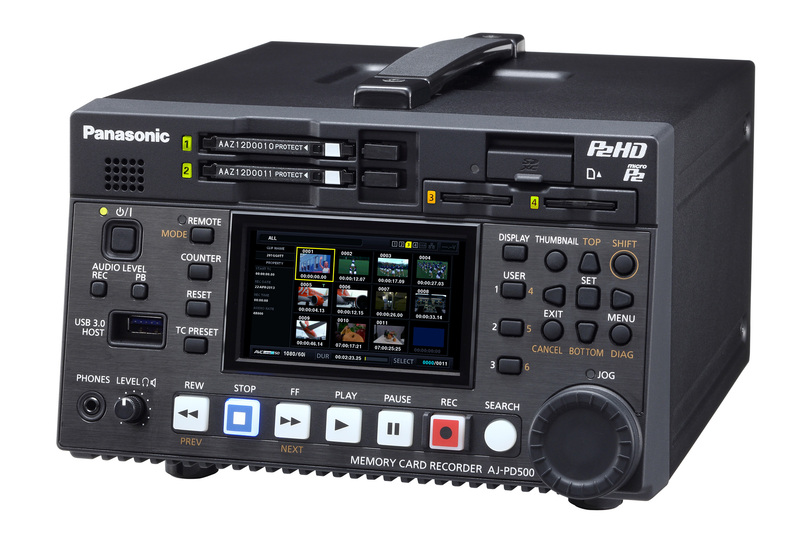 With AVC-Intra 100/50 record/playback as well as AVC-LongG, the AJ-PD500 makes 10-bit, 4:2:2 master-quality video versatile, cost-effective and portable. This ultra-reliable, dedicated deck allows users to play back and review footage on its 8.9 cm (3.5 inches) 16:9 LCD screen; manage clip files and metadata; record full resolution, 10-bit quality content from a wide range of Panasonic and non-Panasonic camera recorders via its HD-SDI input; and back up data onto hard disk drives. The AJ-PD500 offers native 24p 1080 recording and 1080/24PsF input/output. The recorder supports a broad range of high definition and standard definition recording formats including 1080 at 60p/50p/60i/50i/25p/24p; 720 at 60p/50p/24p; and 480/60i; 576/50i in the DVCPRO50, DVCPRO and DV codecs. The unit plays back HD/SD content automatically (no need to change settings) and is internationally operable in 50Hz or 60Hz. The AJ-PD500’s “SuperSpeed” USB 3.0 host interface permits super-fast transfer rates of up to 4.8Gbps. This allows users to easily transfer content to low-cost hard disk drives or solid-state drives for a fast and safe deliverable to clients. When attached to a computer, the USB device mode allows the PD500 to become a two-card microP2 or P2 drive. In addition, users can connect a hard drive to the AJ-PD500, allowing the preview of non-real-time content. This functionality allows for the confirmation of content copied to a drive, and for the reviewing of previously-shot content on a drive. 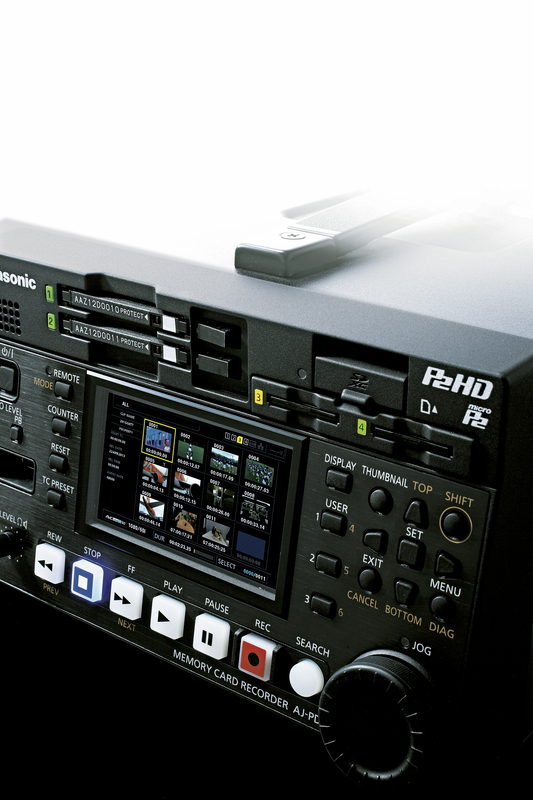 The recorder’s HDMI output enables the transmission of uncompressed digital data to an array of consumer playback devices (video projectors, digital televisions). The deck offers an RS-422A control, thereby allowing it to be controlled as a video source by nonlinear editing systems and colour correction systems. The PD500 features wired connection ability and Gigabit Ethernet. The AJ-PD500 also includes audio I/Os, headphone jack and speaker, timecode in/out and a reference sync input. Additional valuable features include up/down conversion, a USB keyboard connection for easy metadata input, waveform and vectorscope display functions, and a selection from many functions for allocation to six user buttons. In addition to the standard high-resolution proxy recording and AES/EBU four channel 24-bit audio, there is the option to playback AVCHD content*1. *2 Users must select between microP2 and standard P2 card recording. AJ-P2E064FG . Extends Recording Times and Lowers Costs The P2 card offers up to 64 GB*1 of storage capacity. Want to talk to Panasonic?. AJ-P2E032FG . Extends Recording Times and Lowers Costs The P2 card offers up to 64 GB*1 of storage capacity. Want to talk to Panasonic?. This P2 card offers up to 30Gb of storage capacity. 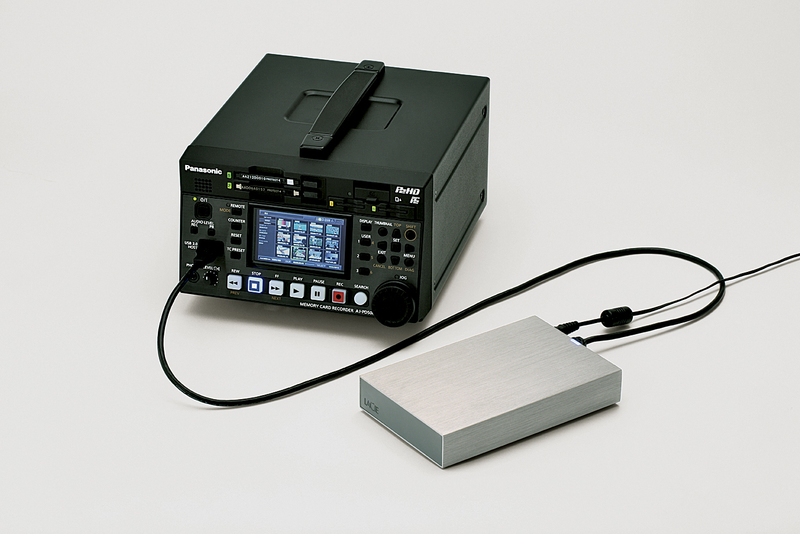 A single P2 card can record up to 30 minutes with the DVCPRO HD or AVC-Intra 100 codec or up to 60 minutes with the AVC-Intra 50 codec.